All the world is fascinated with Facebook Company pages and I get that….Facebook is a popular service but it just feels to me Facebook and it’s company page has the long term business impact of neighborhood kids hosting a lemonade stand and neighbors dropping by to buy a cup which they may or may not drink (the O’Connell children will be hosting a lemonade stand today, BTW). Facebook isn’t the best social media place to do my business. 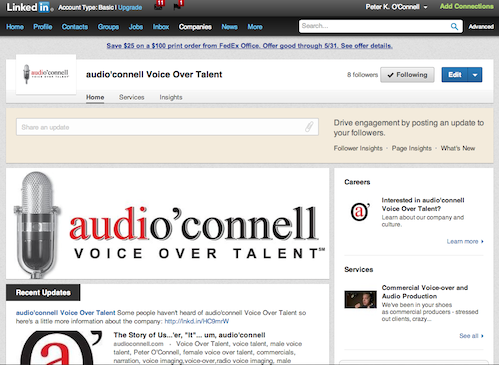 But clearly, LinkedIn has not only every VO talent in the world (oy!) but advertising decision makers, producers, casting companies and business people who seem to me more likely to consider using my services. So my question is this: do you have your LinkedIn Company Page set up? Having a Linkedin company page is really a ‘no-brainer’. I set mine up nearly 5 years ago and currently receive 5-7% of new client leads from that page and also, I have a listing on Manta that has generated several leads in just the few months it has been up. Great advise! Great blog by Peter! Are you a premium member? I disagree with his advice #1 “don’t connect with other V/O’s on LinkedIn” though. As a foreign language V/O I like to connect to other V/Os because they may (as has happened before) get asked by one of their clients: “do you know a German native voice-over?” Of course you do! Send your client my way! Thank you! This stuff is great! So great I tried to sign up to receive these via e-mail on a regular basis. ( I read this one because Paul Strikwerda liked the link on Facebook!) However, I was informed that i am already signed up, so I can’t sign up again, but Peter I’m not getting your blog by e-mail and I wish I was!